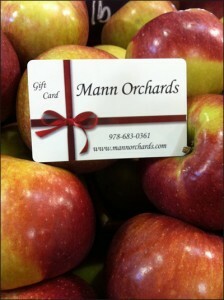 Ju st in time for the gift giving season Mann Orchard Gift Cards are now available online. Choose your amount and send a gift card to anyone you wish to share locally grown produce, fresh picked apples and homemade baked goods with! Now it doesn’t matter how far you’ve roamed, gifting a taste of the Merrimack Valley is just a click away.